So your company has decided it wants to outsource some, or all, of its IT function. You may have noticed that there a great deal of IT support companies out there, but finding the right one for your business can be complicated. Putting a business critical function, such as IT, in the hands of a third party can be quite daunting. How do you know if your provider is reliable? If your service is good value? What will happen if something goes wrong? Interviewing potential suppliers is a vital part of choosing the right IT support provider. Here a few questions to get you started and the types of answers you should look for. This doesn’t mean the location of their head office, but more about where your servers are located. This is important if the IT outsourcing company will be providing services such as cloud hosting or VoIP, as it can affect the quality of your services. GDPR and other laws can also have implications for data storage. Especially for companies working in a highly regulated sector, such as financial services or legal. 2. What geographical areas do you cover? You no longer need your IT support provider based in the same location as you. However, if you plan to move premise or expand into different countries you need to be sure your provider can support you. 3. 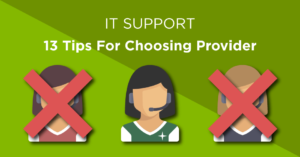 Do you offer different levels of IT support? 4. What exactly is supported in your contract? Be wary of a company who claims to “support everything” without actually going into any detail of what is included. Too often companies think they are getting complete cover, only to discover they can only log a certain amount of support tickets a month or there’s an extra charge for certain services. It is better to be clear from the outset on exactly what level of support you would be getting. Otherwise, you risk getting tied into an unsuitable contract. If it turns out what you were considering isn’t quite right you can always ask whether there are different levels of support. 5. What isn’t covered in the IT support contract? Although you may think this would be covered by asking what is included, asking this additional question will provide you with extra detail. There may be a number of services which are not included in the contract and it is important that you have examples of what may be billed separately. If there are any services which are not included in the support contract, ask about their ad-hoc or hourly pricing. 6. Do you have any guaranteed response times? You should expect your IT support company to offer guaranteed response times in the case of a problem. The exact response time may depend on what level of support you are willing to pay for, and there may be different response times for different priority levels. For example for a high priority issue or a P1, the company might guarantee that you will receive the first response in 15 minutes. It is also important to differentiate between response and resolution times. If your company just says two hours, ask them to clarify if this means they will respond to you within two hours or they will resolve your issue within two hours. If a company guarantees they will resolve an issue in a certain time period, be cautious. Of course, you should expect a target timeframe, but how can they guarantee when a specific issue will be fixed? It can sometimes take longer than expected to get to the root cause of the problem. 7. Do you provide remote management and monitoring? Prevention is better than cure. You want a company who offers 24×7 monitoring and is proactive in their approach, taking action to prevent problems which would cause major disruption to your business. 8. Will we get a dedicated account manager? It’s helpful to have a single point of contact at your IT support company, who you can build a long-term relationship with. They will get to know your business and plans for the future, to ensure IT aligns with your goals. It is reasonable to expect one or two dedicated contacts you can deal with. 9. Will I get a dedicated engineer? It would be unreasonable to expect to only work with one engineer. All technical staff will have different areas of expertise, therefore it makes sense for an IT support provider to assign the best-suited engineer. It’s not necessarily a problem if a company works with specific manufacturers, but watch out for those who put their vendor relationship above your business needs. If your provider is vendor-agnostic they will focus on finding the best solution for your requirements, rather than where it comes from. 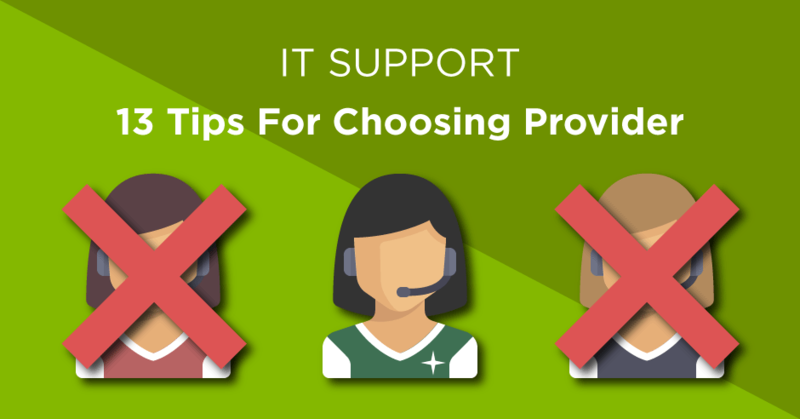 Terms vary depending on the IT support company. Ad-hoc or pay-as-you-go work typically comes with 15 to 30-day payment terms. Contracted work depends on your company’s terms. This can be billed monthly, quarterly or annually, and is usually payable in advance. 12. How can we raise IT problems with you? IT problems are frustrating, so you want to make sure it’s easy to contact the company. Ask if your company has a dedicated number, an online support request system or a direct email address. If your contract includes 24x7x365 support, ask how you would contact the service desk out of hours. 13. If I phone you, will I be able to speak directly to a technician who can help? Does your IT support company operate a call centre where someone simply takes your details and passes it on? Or can you reach the service desk directly? There may be occasions where it’s necessary for your problem to be escalated to a second or third tier of support, but it can be frustrating if you can’t at least speak to someone technical directly in the first place. This list is by no means exhaustive, but it will provide you with a good foundation when you start interviewing the company who may become your IT support provider.